Hopefully you and many other Seattle residents have and will. “There’s No Place Like Home,” a spirited citywide folly celebrating home and stewardship, takes to Seattle streets starting October 21, 2012. A blue Victorian house rolls through city neighborhoods on a series of adventures, accompanied by a family of singing bears and merriment of gnomes. Over the following six weeks, you might see the blue house in your neighborhood, and if you do, be sure to say hello. The happy revelry culminates at twilight on December 8, 2012, at Green Lake Park, just in time for winter hibernation season. 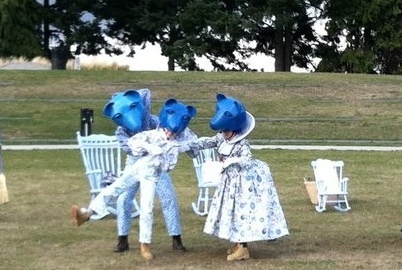 Posted in Performances and tagged as bears, blue house, seattle.